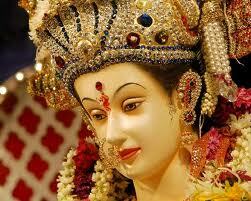 Navratri is traditionally celebrated in honor of Devi, the Divine Mother. The Divine Mother is symbolic of energy, a manifestation of the Divine itself. Each day of Navratri we honor specific qualities of divinity with different homas and with different intentions.It is this energy, which helps God to proceed with the work of creation, preservation and destruction. Navaratri celebration is divided into sets of three days to adore different aspects of the supreme goddess. On the first three days, the Mother is invoked as powerful force called Durga in order to destroy all our vices and defects. The next three days, the Mother is adored as a giver of spiritual wealth, Lakshmi, who is considered to have the power of bestowing on her devotees with the wealth. The final set of three days is spent in worshiping the mother as the goddess of wisdom and knowledge, Saraswati. In order have all-round success in life, we need the blessings of all three aspects of the divine mother; hence, the worship for nine nights. H.H Sri Sri Ravi Shankar, th founder of the Art of Living foundation explains something more on Navaratri.